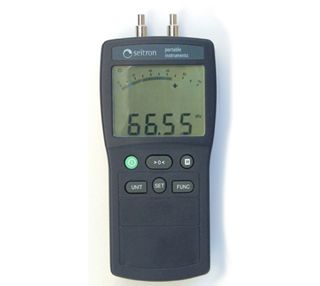 Portable small size digital manometer with 4 digit LCD display, double indication and graded scale. Available in leather imitation housing (containing 2 silicon tubes and a metal tube), allows measuring of pipe network gas pressure, gas pipe pressure loss, combustion chamber pressure, differential pressure on filters. CHEMIST 401: 2 cells (O2, CO/H2), not expandable, with printer, Lithium ion rechargeable batteries, without CO dilution pump. CHEMIST 402: 2 cells (O2, CO/H2), expandable up to 4 cells, with printer, Lithium ion rechargeable batteries, with CO dilution pump. CHEMIST 403: 3 cells (O2, CO/H2, NO), expandable up to 4 cells, with printer, Lithium ion rechargeable batteries, with CO dilution pump. CHEMIST 404N: 4 cells (O2, CO/H2, NO, NO2), with printer, Lithium ion rechargeable batteries, with CO dilution pump. CHEMIST 404S: 4 cells (O2, CO/H2, NO, SO2), with printer, Lithium ion rechargeable batteries, with CO dilution pump. Matrix printer integrated on mainboard: better readability, longer life and better heat endurance. Big and bright LCD display: good readability, due to the ZOOM function and background lighting. Portable small size gas detector with 4 digit LCD display, double indication, graded scale, equipped with internal buzzer. Functions for auto-zero, automatic shutdown, alarm, measuring unit selection, autodiagnose and battery level control. 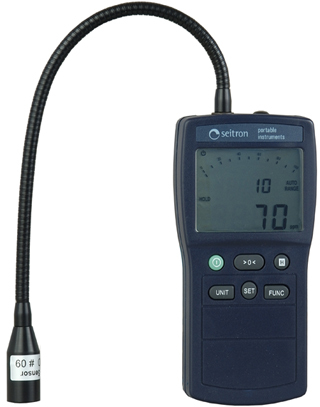 The thermo-hygrometer model TH-380 is a portable, compact, small-sized, easy to manipulate measuring instrument. It is equipped with a microprocessor that converts the measured values of temperature and humidity very accurately. Features: fast response, data storage, memory for minimal/maximal values, auto switch off. 307 is a compact digital thermometer, with 3+1/2 digits, 2 inputs, designed for use with the external K-type thermowell, as a temperature sensor.